Calling all artists: the Passion to Perform Competition is now open! 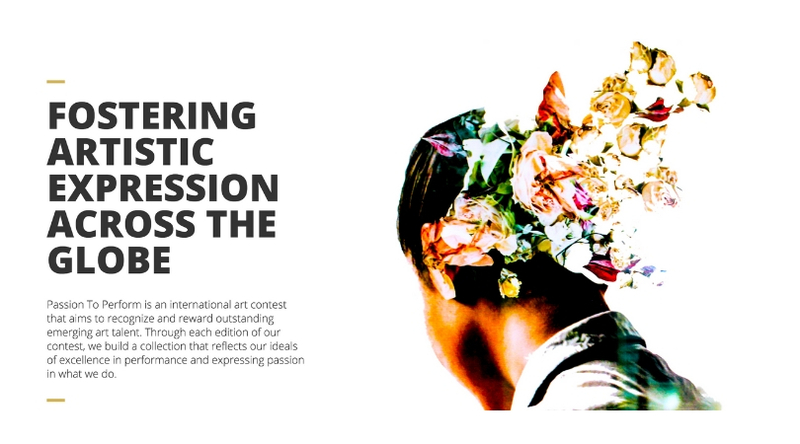 Passion To Perform is an international art contest that aims to recognize and reward outstanding emerging art talent. Through each edition of their contest, they build a collection that reflects our ideals of excellence in performance and expressing passion in what we do. For this year’s contest, artists are welcome to submit paintings, drawings, mixed media, sculptures, and photography as entries to Passion to Perform. The competition is open to any person practicing art. The initial entry is online, followed by the second round of shortlisted works before final selection. Entry is free, at our portal. We will only be admitting 2 entries per person. The panel of judges will initially review entries made through the online system. Following this, approximately 35 artists will be shortlisted. Only works that are shortlisted from the initial digital submission will be reviewed for final judging. Notifications and instructions on the regional collection process will be sent to the shortlisted artists only via email. December 31, 2018: Deadline for online email entries, by 5 pm EST. January 15, 2019: Results of initial entry, including shortlisted notices and instructions on the mailing of works, are emailed to artists by this date. February 1, 2019: Results of the final round of judging and award notice. For more information, visit Passion to Perform. Application for the World Bank’s Young Professionals Program (2015 Selection Process) is Ongoing!